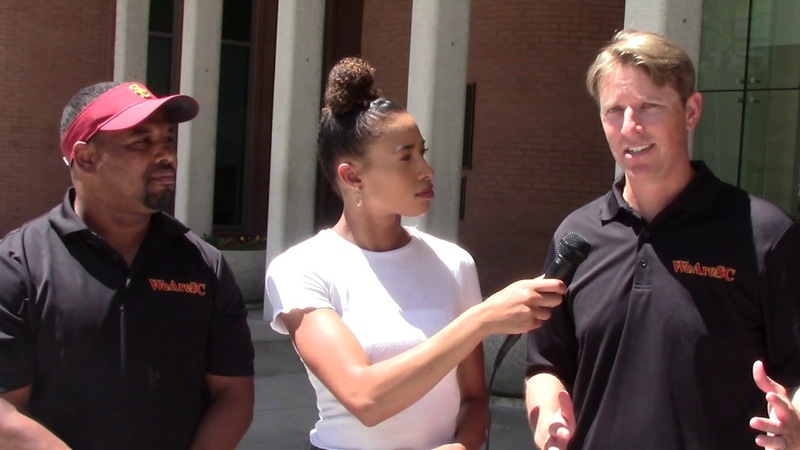 WeAreSC's Lyndsey Lopes, Darrell Rideaux, and Erik McKinney discuss the simplification of the offensive and defensive schemes coming out of spring ball for the 2019 USC Trojans. 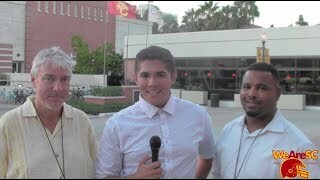 WeAreSC's Angel Viscarra, Garry Paskwietz and Darrell Rideaux break down USC's crucial matchup with No. 19 Colorado this Saturday. The winner of Saturday's contest will take the lead in the Pac-12 South. 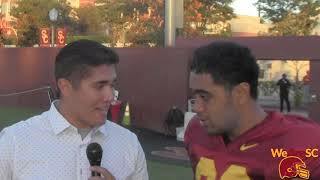 WeAreSC's Angel Viscarra chats with sophomore tailback Vavae Malepeai following the Trojans' Tuesday practice of Colorado week. 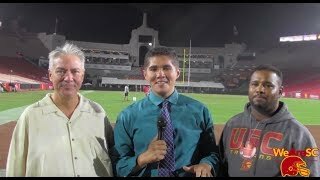 WeAreSC's Angel Viscarra, Garry Paskwietz and Darrell Rideaux take a look at USC's matchup with the Arizona Wildcats this weekend in Tucson. 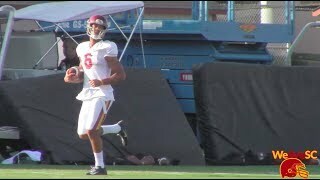 WeAreSC reporter Angel Viscarra chats with USC receiver Michael Pittman Jr. following practice of Arizona week. Pittman reeled in two catches for 72 yards and a touchdown score against Washington State last week. 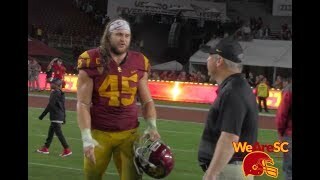 Here are some field level highlights from what was a thrilling fourth quarter in USC's 39-36 victory over Washington State on Friday, September 21st. 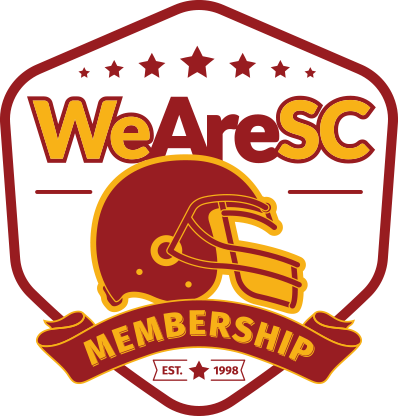 The WeAreSC team breaks down what they saw in USC's 39-36 victory over the Washington State Cougars. The Trojans defend their perfect home record under Clay Helton (18-0) in a night that saw freshman JT Daniels throw for three touchdowns. 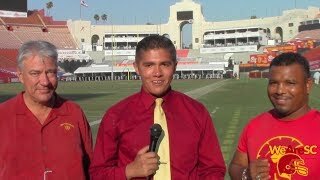 WeAreSC's Angel Viscarra, Garry Paskwietz and Darrell Rideaux break down the Trojans upcoming Friday night matchup with Washington State. USC is coming off of back-to-back losses and is unranked for the first time since the 2016 season. 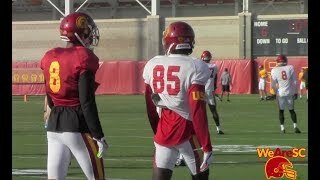 WeAreSC reporter Angel Viscarra catches up with senior cornerback Iman Marshall following USC practice this week. The Trojans are looking to bounce back this Friday against Washington State following a tough pair of road losses. 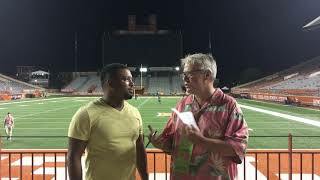 WeAreSC's Angel Viscarra, Garry Paskwietz and Darrell Rideaux take a quick look at the Trojans' upcoming matchup with the Longhorns in Texas this week. 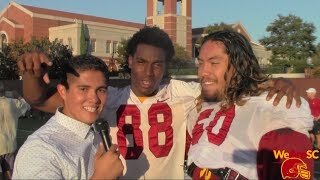 WeAreSC reporter Angel Viscarra chats with USC redshirt senior center and team captain Toa Lobendahn following the Trojans Tuesday practice of Texas week. USC is coming off of a 17-3 loss against Stanford. The No. 22-ranked Trojans will have the chance to bounce back this Saturday on the road in Austin, Texas. 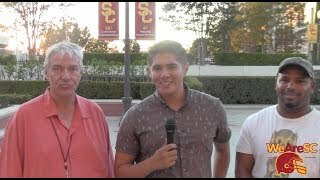 WeAreSC's Angel Viscarra, Garry Paskwietz and Darrell Rideaux take a look and break down what they think'll be important to keep an eye on as the Trojans take on the Stanford Cardinal this weekend. 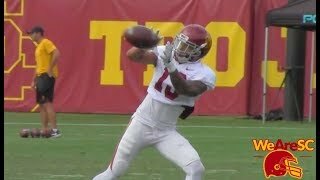 WeAreSC reporter Angel Viscarra takes some time to chat with redshirt sophomore receiver Trevon Sidney following USC's Tuesday practice of Stanford week. 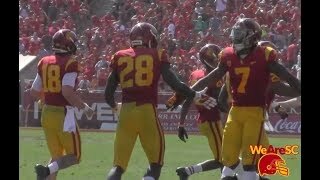 Sidney reeled in three receptions for 72 yards in the Trojans' Week One victory over UNLV. 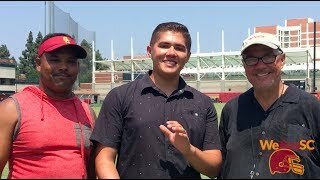 WeAreSC's Angel Viscarra, Garry Paskwietz and Darrell Rideaux break down what they saw from USC in the Trojans' season-opener against UNLV. 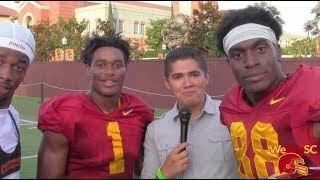 WeAreSC's Angel Viscarra, Garry Paskwietz and Darrell Rideaux all take a look at the Trojans upcoming matchup with UNLV this Saturday. The team chats up UNLV's running game, JT Daniels and some impressive freshmen on this USC roster. 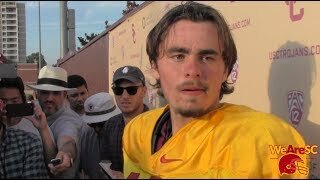 JT Daniels tends to the media for the first time as USC's starting quarterback on Aug. 28th. 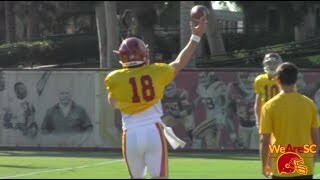 Daniels is the first true freshman to start a season for the Trojans since Matt Barkley did so back in 2009. 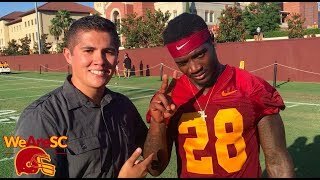 WeAreSC.com reporter Angel Viscarra takes some time to chat with USC starting receiver Velus Jones Jr. 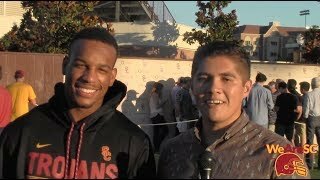 This interview also includes some cameos from Tyler Vaughns and Daniel Imatorbhebhe. 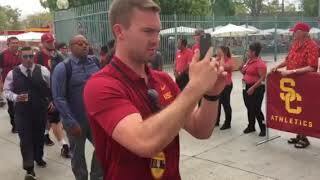 WeAreSC.com reporter Angel Viscarra catches up with USC senior safety and team captain Marvel Tell III following the Trojans' Aug. 22 practice. 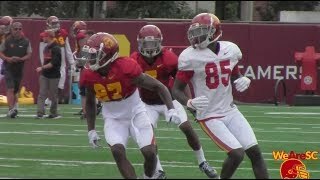 WeAreSC's Angel Viscarra, Garry Paskwietz and Darrell Rideaux break down USC's second scrimmage of fall camp. 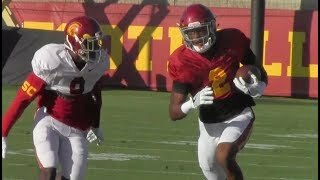 The WeAreSC.com team breaks down the quarterback competition thus far through camp, the defense's solid outings and much more. 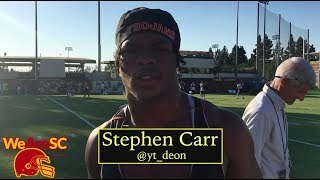 USC sophomore running back Stephen Carr tends to the media after a fall camp practice on August 6th, 2018. 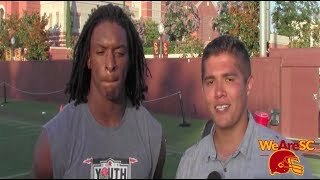 WeAreSC reporter Angel Viscarra chats with Trojan RS senior cornerback Ajene Harris after USC's most recent fall camp practice. Harris, who had several standout moments in 2017, is looking to capitalize with a strong senior campaign. 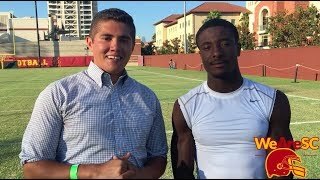 WeAreSC reporter Angel Viscarra takes time to catch up with senior running back Aca'Cedric Ware following day one of USC fall camp.